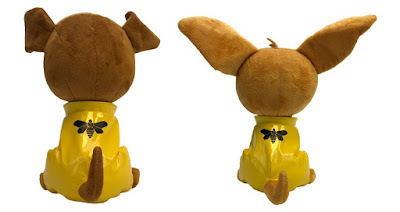 Factory Entertainment has some exciting, officially licensed exclusives lined up for San Diego Comic-Con this year, including this adorable Breaking Bad Pawzplay Plush Figure Box Set! Just like people, these cute pets love to show their Breaking Bad fandom and want to be involved in the exciting culture of cosplay. The world of Pawzplay features kittens and puppies dressed as their favorite pop-culture characters, and these cosplaying canines will be barking bad exclusively for Factory Entertainment at SDCC 2018. This San Diego Comic-Con 2018 Exclusive Break Bad Pawzplay Plush Set features a pit bull cosplaying as Walter White and a chihuahua cosplaying as Jesse Pinkman, both wearing matching yellow lab coats. Each Breaking Bad Pawzplay Plush Doll stands 8” tall and the set comes packaged in a Los Pollos Hermanos Mucho Meal bag. This Breaking Bad set can be pre-ordered now at the Factory Entertainment online store for $30 for either pick up at their SDCC booth #2647 or for shipment after the convention.